When I was a kid, I would sometimes awake to the sound of a rusty door opening on its hinges and the fevered rustling of a cellophane package that would echo through the dark kitchen, very late at night. I never became alarmed, since I knew it was just my dad on the hunt for his favorite midnight snack, graham crackers with peanut butter and jelly. The next morning, my granny would be up early. She’d wink at me and say, “I see someone was in the cookie drawer again last night,” buttering the toast as my father looked up from his coffee. My dad would sternly deny it, but the evidence or lack thereof, was in the form of a half-empty graham box, and a drawer full of crumbs. Granny would fill the cookie drawer each Monday with new boxes of cinnamon graham crackers after her weekly grocery shopping. So what is the goal of the midnight snack, I wondered laying awake, unable to sleep on a Thursday night. Is it to curb hunger, quiet a troubled mind, or a comforting way to lull one back to sleep? No matter. But if I were a midnight snacker, what would I choose? I would want something that would provide nutrition without racking up tons of calories, yet something satisfying that helps me to go back to sleep, a snack to quiet even the loudest tummy grumbles. Cereal – sounds tempting. It’s certainly one of the greatest hits with snackers of all ages, especially the college boys and girls. Some folks, I hear, rely on it as a meal replacement, midnight snack, breakfast, and sometimes a late weekend lunch which I do not recommend. A lot of cereals out there can double as desserts – so skip the sugary stuff made with chocolate, peanut butter, and high-fructose corn syrup. It’s tough on the waistline and sugar is certainly a stimulant, deadly for the exhausted midnight snacker. Also, have you seen the serving size? It’s a 1/2 cup most times, geez! That means it takes a grown man 3-4 bites to finish a snack that could be hundreds of calories! If you’re going that route, by all means reach for the fat-free, skim milk and choose a low-sugar, high-fiber cereal. But I don’t have cereal in the house right now. So what other carbs would I fancy on my midnight snack rendez-vous, cheri? How about a slice of toast? I’ve recently learned from Joy Bauer that carbs can make you sleepy, that might just do the trick. I always recommend the whole grain variety to boost the fiber, so you get an added health benefit while snacking on whole-grain bread that is hearty and satisfying. A handful of nuts might be good as well since they kill hunger – but the more I think about it, let’s go with almonds since they have tryptophane that cool compound in turkey that makes your sleepy. They also happen to be heart-healthy because they have very little saturated fat. I love almond butter, but drat – just 1 tablespoon is around 10 grams of fat, even though it’s the good kind. You need to factor that in if you’ve had a lot of fat that day, say, more than 60 grams. Or you can have 10-12 dry roasted almonds, if your digestion is good and for about 7 grams of fat and a small slice of whole wheat pita. 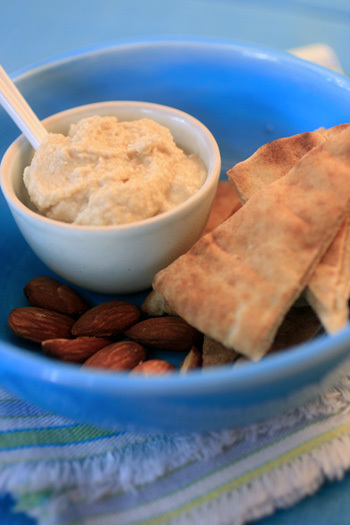 If you want to opt for something fat friendlier than almonds, go for hummus. You’re looking at 2 tablespoons at about 3 grams of fat, more smear for your buck than almond butter and guess what, beans are heart healthy too! Besides that, hummus comes in a million and one flavors to shake it up a bit! Alright, I’ve got my midnight snack planned out, it’s a small whole wheat pita, with roasted garlic hummus and few almonds to keep my mouth busy while I toast the pita. Well, this midnight snack has become breakfast now, it’s already 4 am, and it’s time to start my oven for the cookie 500, grand prix. What’s that you say – a cookie race? Yes, I’ll be baking 500 cookies this morning for a trade show. Time to turn on my oven and get to work! Check out Joy Bauer’s book to learn more about foods that help you sleep and how they affect health. Learn more about almonds and how they affect health. had been searching for something very similar and was grateful to acquire the tips through this posting.